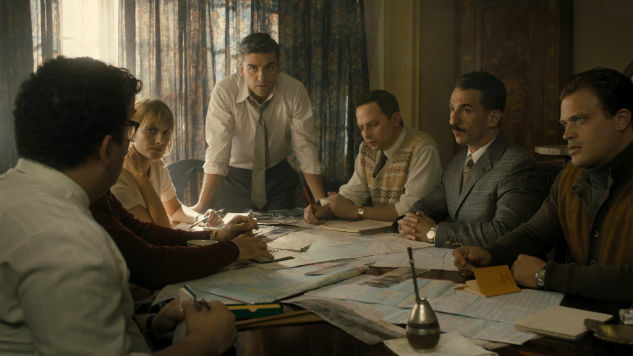 Oscar Isaac is in pursuit of justice in the full-length trailer for Operation Finale, from MGM. Set in 1960, 15 years after the conclusion of World War II, the film stars Isaac as Peter Malkin, an agent of Mossad, Israel’s intelligence agency. Malkin has a new lead on the location of Adolf Eichmann (Ben Kingsley), the mastermind behind the Final Solution and the deaths of millions of Jews. “This guy convinced rabbis to load the trains themselves, and not by force,” narrates the trailer ominously, as Eichmann stares at a swarm (or, more specifically, a murder) of crows. The film is based on a true story. The trailer cuts back and forth between scenes from World War II and Malkin’s investigation in 1960. Since the conclusion of the war, Eichmann has gone into hiding in Argentina, where Malkin follows him with a team. However, Malkin is not leading a hit squad, instead attempting to extract Eichmann from South America to stand trial in Israel for his crimes. Operation Finale was directed by Chris Weitz, who most recently wrote Rogue One: A Star Wars Story. The film will additionally star Joe Alwyn (Boy Erased), Mélanie Laurent (Inglorious Bastards) and Nick Kroll (yes, that Nick Kroll, like the one you love from Big Mouth), in a dramatic role that is unusual for the actor. Operation Finale hits theaters Sept. 14. Watch the trailer below.